A health alert has been declared in Brazil, Paraguay and Bolivia after an outbreak of dengue fever. The authorities have blamed higher rainfall this season as a cause of the unusually rapid spread of the disease. 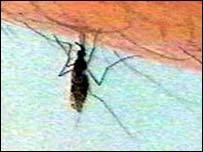 Experts also say the uncommonly warm weather has boosted the population of mosquitoes, which transmit the disease. Globally, it infects 50m people a year, the UN says. It starts as a flu-like illness but without the proper help it can develop into a deadly fever. Dengue fever is not uncommon in South America, where thousands of cases are recorded every year. The difference this time is the speed with which the disease has spread across the south of the continent. Brazil, Paraguay, Bolivia and, to a lesser extent, Argentina have been affected by the outbreak - but it is Brazil and Paraguay which have seen the worst of it. In the south-western Brazilian state of Mato Grosso do Sul it is estimated that more than 15,000 people have been infected this year - more than all the cases registered in 2006. In Paraguay there have been more than 3,000 cases and four people have already died. In Bolivia, a young nurse died last week. The authorities have called on the population to take more preventive measures to avoid infection. In the meantime, the authorities in Brazil, Bolivia, and Paraguay have declared a health alert and increased measures to try to stop the outbreak from escalating into a fully-blown regional epidemic.